Independents' Day is the national campaign to celebrate and promote the UK's independent retailers on 4th July. 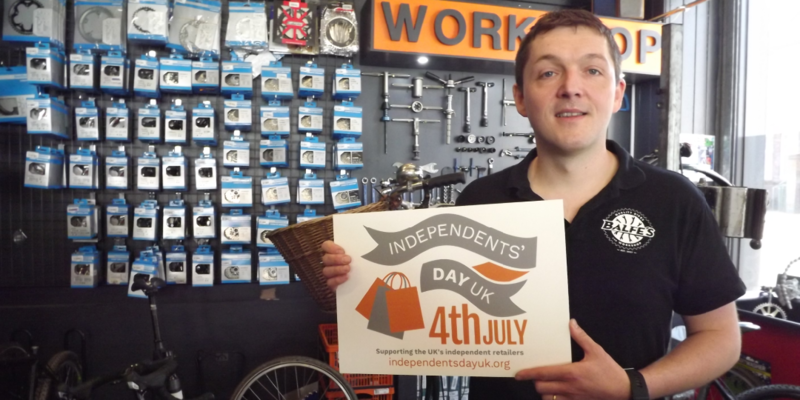 Independents' Day UK is a not-for-profit campaign that exists to support and promote independent retail businesses across the UK all year round, but with an annual focus on July 4th: ‘Independents' Day' itself. Independent retailers offer choice, diversity of product and service, tradition as well as innovation, and a more personal service to customers. They are also job creators and contributors to local and national economies. And with retail spending under pressure, never have they needed our support more. On July 4th retailers get involved by running special events and promotions including themed window displays, high street festivities, discounts and offers. As a shopper Independents' Day UK is your chance to show some love for the independent retailers you value most both in your local communities and online: the ones you wouldn't want to live without. Here's how you can get involved to help make Independents' Day UK a success for those businesses and others. Follow & engage with the campaign across social media platforms. Share the campaign with you friends. Give a shout-out on social media to the independent retailers you love and value most - be sure tag any posts with the hashtag #ukindieday. Ask the independent retailers you visit or know if they are involved with Independents' Day UK. Make a list now of one or two independent retailers that you've never visited before and pledge to pay them a visit for Independents' Day on July 4th - your visit will make the world of difference!